Nicole's Needlework: I Hate Sewing!! I decided to get out the sewing machine and finish a couple things. What a mistake! I am the worlds worst sewer. Isn't it funny that sewer is spelled the same as sewer. Maybe there's a reason for that - because I stink! 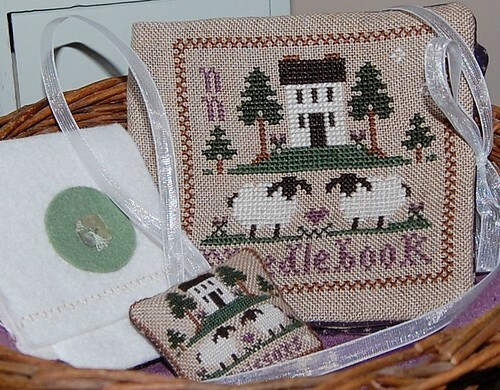 :) Anyway, I decided to finish up my LHN Wool Needlebook and Fob that I stitched earlier this year. I totally messed up the fob. It was all even except one side, so instead of just ripping out the one side I made it all smaller and then I accidentally sewed my ribbon to it and I got frustrated and ripped it all and sewed it over. Argh! So then I decided to sew up the Needlebook. I ripped it out once because I can't sew in a straight line and then I finally got the lines somewhat straight, but there's too much of a border on the left side. Do you think I'm ripping again? No, I don't think so! I still need to tack in the felt pages. I'll do that when I'm feeling a little less stressed. I think I need a break from sewing right now (or forever). I also finished an ornament, but I can't share it right now because it's for an exchange. Big sigh. Now I'm just going to stitch and forget there is even such a thing as finishing. Write later! I know exactly how you feel that is why i don't even bother touching a sewing machine. LOL I want to learn but since i have been learning these new techniques from Jane's class and Vonna's tutorials, i think i can just hand-sew better than a machine. LOL hang in there! they look great to me! I can't machine sew worth a hoot either. People ever understand why I can't sew on a machine but can do all kinds of fancy hand stitches LOL I don't know! I've resolved to just stick with hand finishing methods and stay away from the machines. LOL---I've had those days too. I recently trashed a halloween costume (with pattern still pinned to fabric)--YIKES! Most times, sewing is a relaxing venture to me, but not lately. Your projects look great regardless! I'm the same way. The sewing machine and I are not friends. Hand sewing takes forever, but worth it. Oh, I like Carol R's suggestion. Thanks. I also do a basting stitch around the piece to help me when I use the sewing machine. It works for me. Carol R's idea is much quicker though. I usually finish everything by hand. I enjoy that aspect of finishing. Good luck. Try Carol's idea, I'm going to. I think that they turned out wonderfully! Don't be so hard on yourself. ROFL Nicole! Next time just take a deep breath before, during and after! I never use the sewing machine but prefer to hand sew everything. It takes longer of course, but in my opinion the extra time is well worth it. That's why I stopped stitching smalls altogether - because I couldn't do the finishing. 1/4" from my needle to get consistant seam.) I sewed the entire quilt with this taped by my presser foot and it worked wonderfully! I just had to laugh when reading your sewing machine experience, it sounds just like mine! I have to be super motivated to get out my machine and have lots of time so I can go very very slowly, but I still feel a bit stressed at the end.